If you’ve gone through the trouble of installing plumbing for your outdoor kitchen sink, you’ll want to keep everything working as well as possible. Caring for an outdoor sink isn’t quite the same as caring for an indoor one. After all, a sink in your outdoor kitchen will be exposed to the elements, as well as more drastic shifts in temperature. Your outdoor kitchen’s sink will be exposed to rain, pollen, mold spores, dirt, and occasionally ice, so a regular kitchen sink probably won’t do. You’ll need something that resists rust, won’t crack due to temperature shifts, and inhibits the growth of mold and bacteria. We’ve found that a sink basin made of 304-grade stainless steel is the best bet for an outdoor kitchen. It’s easy to keep clean and it’s rust-resistant. When it comes to faucets, stick with stainless steel or possibly brass, and consider protecting it with a physical vapor deposition (PVD) finish. Stainless steel, as its name implies, doesn’t stain as easily as other metals, but it’s not invincible. And don’t forget that it will probably end up with leaves, pollen, dust, and (if you have a fire pit) ash landing inside of it. So be sure to clean it regularly to keep it sanitary and looking great. Avoid harsh chemical cleaners, since they may end up washing into your yard and down into the soil, and don’t use abrasive materials such as steel wool that can leave scratches. Wipe your stainless steel sink down with regular dish soap and warm water from time to time, and occasionally spritz a little vinegar to disinfect it. If you’ve got fingerprint smudges, rub them away with a little baby oil or even olive oil on a microfiber cloth. Never pour fats or oils down your drain! Even if you have a garbage disposal installed in your sink, keep meat drippings, salad dressing oil, dairy, and anything else with a high fat content away from your drain. Though they may wash down easily when in liquid form, eventually they’ll congeal on the inside of your pipes, and may eventually block them entirely. The last thing you want to deal with during your cookout is a smelly clog! We don’t often get below-freezing temperatures here in San Jose, but if a cold snap is predicted, take precautions. Shut off the water to your outdoor kitchen sink, and then turn on the faucets in order to empty your pipes. This way the water inside them can’t freeze and cause your pipes to burst. 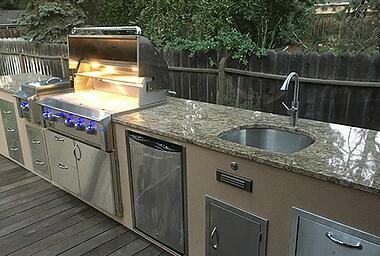 As an additional precaution, you may want to consider insulating the pipes beneath your outdoor kitchen sink. We hope these tips are helpful! If you’re still in the planning stages of your outdoor kitchen and would like some expert advice on where to place your sink, give one of the designers at Unlimited Outdoor Kitchen a call at 1-888-7-GRILL-IT.